Cognition: A Key Factor in Interpretation and Visualization? At the 2012 annual fall meeting of the American Geophysical Union, Clare Bond, Carol Ormand, Robert Krantz, and Iain Stewart convened a session focusing on the role of cognition in spatial thinking. Posters in this session described research on 3D and 4D thinking. Here are links to their abstracts and, in some cases, electronic posters, hosted on the AGU website. 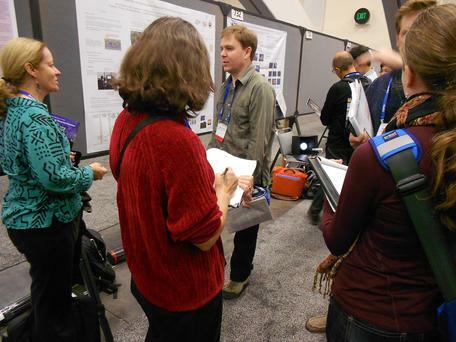 2012 AGU poster session on Cognition: A Key Factor in Interpretation and Visualization? Photo by Carol Ormand. What Do Geoscience Experts and Novices Look At and What Do They See When Viewing and Interpreting Data Visualizations?